We are excited to announce the opening of modern Sumiyaki restaurant Jinjo – the latest addition to our vibrant collection of restaurants at Shaw Centre. Helmed by veteran washoku chef Makoto Saito, Jinjo is where traditional Japanese fare is presented with a contemporary spirit. Japanese charcoal-grilling mastery is celebrated through a prefecture focused menu where prime seasonal ingredients are sourced from all over Japan, so that guests get the best flavours of the season. Cooked over charcoal, these ingredients are imbued with a delicious smokiness. Highlights of the menu include Yaki Goma tofu (handmade tofu with red miso from Aichi), Nodoguro (Black throat sea perch from Ishikawa), Satsuma-Imo (Sweet potatoes harvested in Chiba for spring and summer, and in Okinawa for Autumn and Winter), Seseri (Grilled chicken neck served with Miyazaki style) and many more. 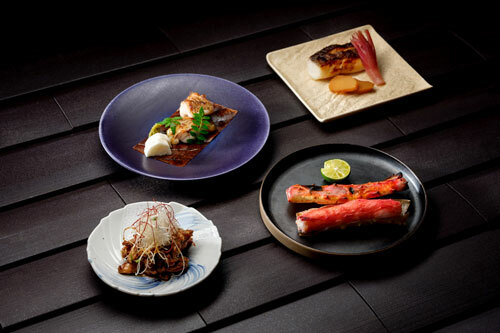 Complete the dining experience with our selection of prefecture focused sake menu, specially curated to pair the taste profile of Jinjo’s sumiyaki items. So come on down to Shaw Centre and join us at our new restaurant. We can’t wait to share this experience with you.